Before you file your IND… - IMPACT Pharmaceutical Services, Inc.
You’ve determined that you need to file an IND to conduct human trials in the US. What do you need to do before you submit your IND? While INDs can be opened at any stage of product development, the main focus of this post is on pre-IND activities for those being submitted to support first-in-human studies. Animal Pharmacology and Toxicology Studies – Preclinical data to permit an assessment as to whether the product is reasonably safe for initial testing in humans. Any previous experience with the drug in humans (often foreign use) should also be included. Manufacturing Information – Information pertaining to the composition, manufacturer, stability, and controls used for manufacturing the drug substance and the drug product. This information is assessed to ensure that the sponsor can adequately produce and supply consistent batches of the drug. The CMC information should include details about: (1) drug substance; (2) drug product; (3) placebo formulation, if applicable; (4) labeling information for the labeled products relevant to the investigational drug; and (5) an environmental analysis for assessment of the effects of the investigational new drug or biological product on the environment (though many products qualify for an exemption from this assessment). Throughout the life cycle of an IND application and in each phase of the investigation, sufficient information will need to be submitted to assure the proper identification, quality, purity, and strength of the investigational drug. It may be helpful to review FDA guidance for CMC of biologics and nonclinical safety studies. The IND should also include clinical protocols and investigator information. Detailed protocols for proposed clinical studies are required to assess whether the initial-phase trials will expose subjects to unnecessary risks, and information on the qualifications of clinical investigators—professionals (generally physicians) who oversee the administration of the experimental compound—is required to assess whether they are qualified to fulfill their clinical trial duties. Finally, commitments to obtain informed consent from the research subjects, to obtain review of the study by an institutional review board (IRB), and to adhere to the investigational new drug regulations should be included. A pre-IND meeting is a formal meeting with the FDA to discuss the contents of your future IND. The pre-IND meeting is an opportunity to build a relationship with the FDA and gain valuable feedback on any questions you have regarding the development of your drug or biologic. It is advisable to meet with the FDA early in the drug development process so that any recommendations and answers to questions can be integrated into the development program. These meetings are most effective when they are focused on specific scientific or regulatory issues, such as clinical trial design, pharmacology studies, toxicology studies, acceptability of novel formulations, dosing limitations, data requirements for an IND application, and regulatory requirements for demonstrating safety and efficacy to support a new drug approval. The pre-IND meeting is also an opportunity to discuss your regulatory strategy with FDA, including methods to enhance drug development, such as Orphan Drug Designation, Fast Track Designation, Breakthrough Therapy Designation, Accelerated Approval, and Animal Efficacy Rule processes. Additionally, so-called “pre pre-IND” meetings are available through the Office of Tissues and Advanced Therapies (OTAT) in CBER for cell-based therapies (mentioned in a previous blog post ). This is an informal discussion conducted by teleconference focused primarily on preclinical issues and is not part of the formal meeting process. The timing of the pre-IND meeting request usually depends on the product. If the studies required to obtain the information necessary to establish that the product will not expose humans to unreasonable risks are well known, then the meeting can be conducted after these data are available. However, if the sponsor requires FDA input on the design of the planned nonclinical studies, then it is best to request a meeting before these studies are performed. Conducting nonclinical studies after obtaining FDA input can avoid expensive rework. To have a pre-IND meeting with the FDA, a formal request is submitted with information regarding the product and indication, draft questions for FDA, an agenda, proposed dates and times, and a list of attendees at the meeting. The focus of the questions should be on preclinical studies, any key CMC issues, and the design of the initial clinical trial. A list of contacts in CDER for pre-IND meetings is available here. The agency is supposed to schedule a meeting (or reject your meeting request) within 21 days of receiving the request. If a meeting is scheduled, it should occur within 60 days of the request. A meeting package will be due within 30 days prior to the scheduled meeting date. What is the purpose of the pre-IND meeting package? Ask specific, well-phrased questions focused on scientific and regulatory issues. Don’t hide concerns. FDA can only provide meaningful feedback if they are aware of all the pertinent information. Not addressing a concern won’t make it go away! Don’t present data not included in the meeting package. FDA will not be able to comment on information they have not had an opportunity to review in advance. Obtain clear and concise feedback by listening carefully and asking appropriate follow-up questions if needed for clarity. Make the best use of allotted time. Prioritize the issues you need to discuss with the FDA at the meeting, and watch the clock! 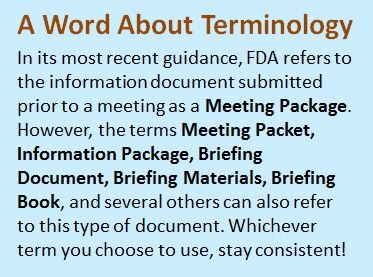 For more information, see the FDA guidance for formal meetings. If you found this post helpful, keep an eye out for our upcoming blog post on the submission of an initial IND. And as always, please contact us if you have any questions or if you need any help with your upcoming INDs! Ready to Submit Your Initial IND?